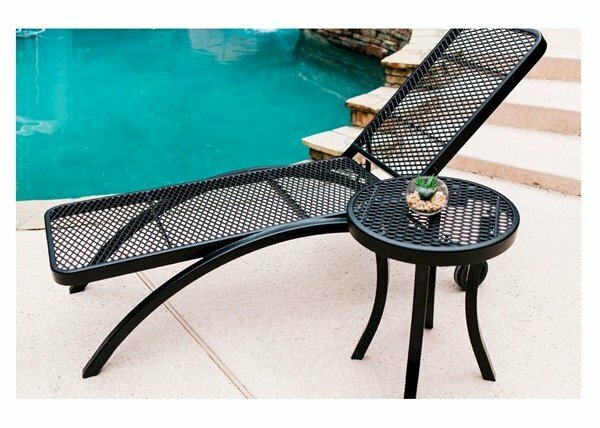 Plastic Coated Metal Patio Chaise Lounge - 89 lbs. This plastic coated metal patio chaise lounge is perfect for high wind areas due to its strong resistant to the outdoor elements and its heavy weight. The seat is made from 3/4" #9 expanded metal and the frame is 1/2" x 2" metal strap giving it over double the weight of a traditional chaise lounge. Due to the mass, 6" solid plastic wheels have been added to the back for easier movement. Coated with the same textured polyethylene finish that is used on commercial grade picnic tables, this chaise lounge will look beautiful for many years without chipping or fading. Features 3 reclining positions and can lay flat for comfortable sunbathing. For the best quantity discounts on this chaise lounge and more give Furniture Leisure a call for a fast quote!